This is really old, but I thought I should post it anyway because it is simply amazing. This guy, Francesco Coriglione, made this breath taking Gundam diorama for the Bandai World Competition. It has a RX-78 Gundam sitting in his room adorned with Gundam and Bandai merchandise, building his own model! The whole thing is very meta. 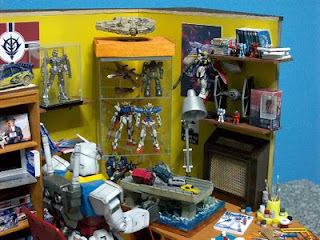 Go to his blog on Danny Choo, to see more very detailed, and highly intricate pictures of everything in this Gundam Otaku's room. There are even DVD's on the top shelf with box art, with SGT Frog model kit boxes next to them. Excellent work!